Are you ready to heal an aspect of your womb or birth experience? Ready to clear the path for 2014? Set Intentions for a new year and a new you? IF you answered yes, please sign up right now for this magical ceremony! our wombs and the time we spent in the womb. 2014 Intentions and anchor those intentions into your being. set an intention for 2014 and created a sacred bundle. womb to rebirth ourselves and the Sun. your intentions and new Wisdom Code. and intention for 2014! POWERFUL! In the darkness of the womb we can create profound magic! You will receive a new Wisdom Codes to carry you energetically through 2014! those who need closure from the loss of the womb to heal that as well. Deep healing and a rebirth will assist you on your journey as we move into 2014.
lovingly supporting your heart’s desire? Are you ready to feel more grounded in your manifesting and desires? 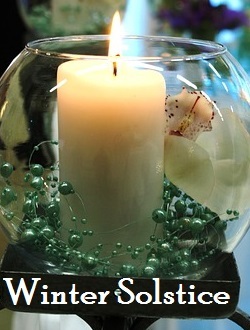 Winter Solstice in the Northern hemisphere marks the longest night of the year. grow once again and the days become longer, little by little. in manifesting your dreams for 2014! during processes, but your pace, your voice and your style were very engaging and enriched. So much so I wanted to share my experience with you. was holding in my body disappear completely after you brought the light in each time. It was instantaneous all three times. The meditation was very powerful and surprising. After all, Divine Mother looked an awful lot like Heidi Klum, haha. blonde braids, I was tall and slender and wearing long white robe. I felt at peace and content and….I felt joy. Not as a reaction or response, but as an inner state of being. I have never actually felt this emotion this way in my physical form. As the picture kept coming into focus, I realized the symbol itself had been shaped like a rudimentary angel. I have never affiliated myself with any angelic qualities whatsoever. This truly took me by surprise. simply by BEING ME. This new perception of my physical and spiritual incarnation was so authentic and at peace. I was completely unaware of. A new road, a new path, sovereign creator, new earth angel. I can’t wait to listen again. I have just listened to the mp3 as I was not able to be on the call. I did however place my intention that I was on the call energetically !! I started out @ a 10/1/0 and reduced to 0 🙂 so I was very happy with the outcome. I was working on a relationship to bring in my soul mate. It came up not trusting !!! I have done so much work on this. My mum was the gate keeper. I also went back to childhood around my father @ the age of 3 years. The lighting of the candle and bringing in the codes was the spark of radiance of the universal language of love …. The water was like an elixir ……. Like. treacle , soft and smooth. long time (it’s part of my Christmas decorations), and the white bulbs at the top of the three candles seemed to develop a special glow. What did you observe during the clearing and healing time of the class? about the teaching, but whatever is holding me back from doing things like finishing my website. subconscious meant by “Try” being the problem. In one of the “Star Wars” movies Yoda says “Do or do not. There is no try.” I think I need to learn that lesson better. Thinking about something isn’t the same as actually doing it. P.S. I could “feel” a lot of this issue in my stomach. My stomach pain would rise and fall as I thought on this matter. What was your starting number and ending numbers? My numbers kept going up and down. From 2 to 5 and back down to 2. 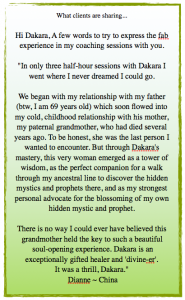 What did you experience while in the Womb of Divine Mother? I just felt great peace. I noticed that her eyes were blue even before you said they were. I don’t recall too many specifics, just the wonderful feeling of being loved unconditionally.